The instructions: Soften the shea butter by melting it only slightly in a pot on the stove. (If your shea butter is already soft, there is no need to melt it.) Mix in the grapeseed oil then follow with the honey. Lastly add a few drops of lip gloss (or lipstick) for color. (This prior step is optional.) Allow the mix to set, and that's it! You have your lip balm. 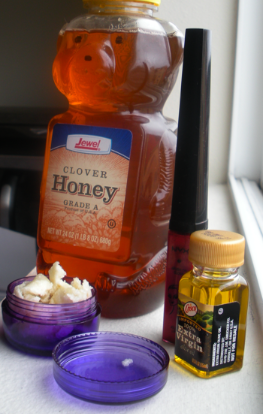 For other lip balm recipes, check this earlier post. Nice recipe! I'd love to make my lip balm and store it in a handy place like that. Where did you get the container?